Let me start this recipe by posing a question…what do we all really want in this universe? Do we all really want world peace? Yes, of course. Did I also include a Miss Congeniality gif? Maybe. But seriously, if you’re being a bit more selfish with your answer, you know that all anyone really wants in this world is to eat dessert for breakfast every day, but be healthy at the same time. I had heard about chia seeds, and chia pudding, but I’m always a little bit wary to try new foods that are considered “trendy.” (Confession: I’m not a huge fan of kale. Sue me!) But I did it anyway, and now I’m kind of in love with this weird little seed! 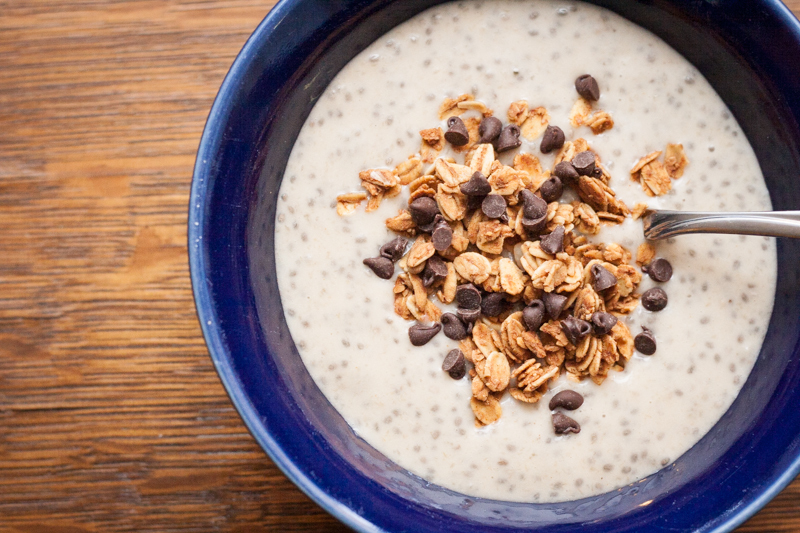 When mixed with water or any other liquid, chia seeds form a kind of gel. I’ve used this gel to help bind black bean burgers together, and it works great for that as well! 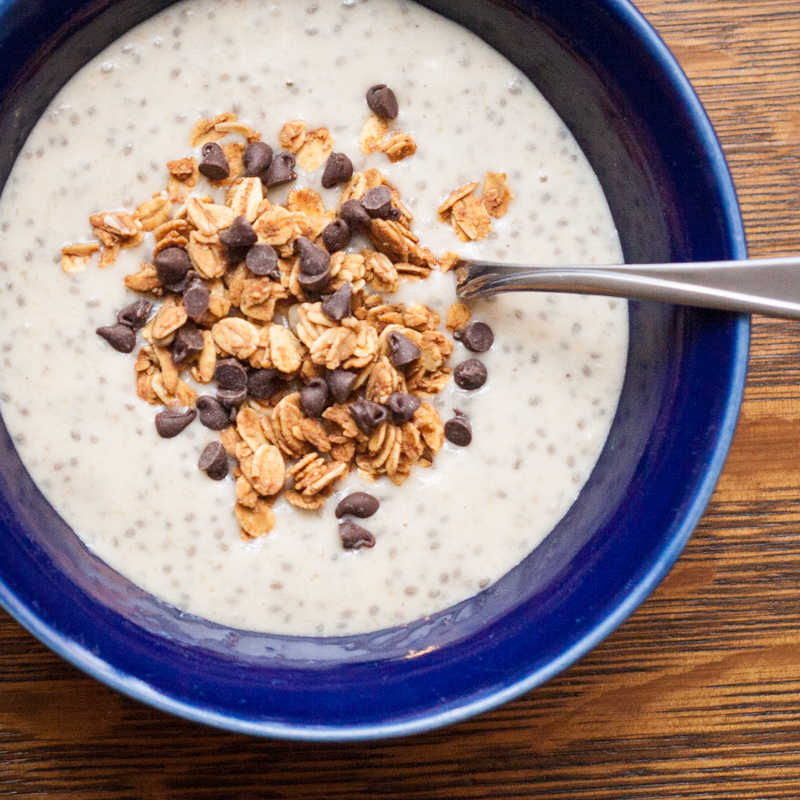 So when you mix more chia seeds with more liquid, you get a pudding, much like tapioca. A lot of people have been eating this pudding for breakfast, since (if you use the right ingredients) it can be crazy nutritious. So that’s what I did! I made this in the evening, and had it for breakfast the next morning. I plan on trying more flavor variations as well, so stay tuned! Blend banana in food processor until smooth. Add almond milk and peanut butter, blend until well mixed. Transfer the mixture to a tupperware container and stir in the chia seeds. Let sit overnight. 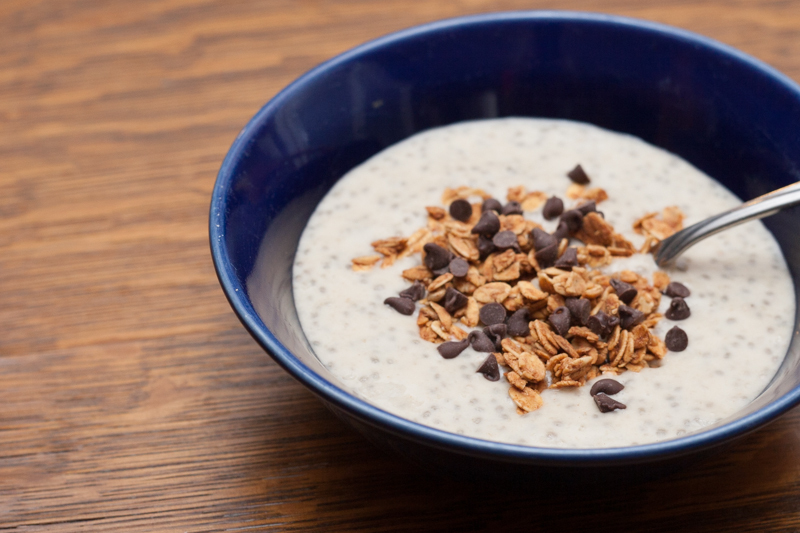 In the morning, top with anything you like from fresh fruit to chocolate chips! I added the gluten-free Love Grown granola and some chocolate chips for crunch, because I’m a grown-up and can eat chocolate in breakfast whenever I want, damnit! Sorry…got excited about breakfast there for a second. The pudding itself is vegan, so you can have a gluten-free, vegan, healthy dessert-breakfast after just a couple minutes of work! Again, stay tuned for more flavors, and enjoy your dessert breakfast!